One of everyone’s favorite Justice League heroines is finally getting her shine. 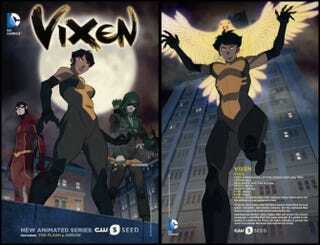 Vixen is Mari McCabe, the superhero with a magical Tantu Totem, which she uses to adopt the abilities of animals. Mari, who is originally from Africa, was left an orphan after her parents were killed. Mari inherited the family’s totem, and as Vixen, she fights to protect the world from the exact corruption that tore her family apart. It was recently announced during the Television Critics Association press tour that Vixen’s story will be told via the CW’s digital-only studio. The Web series, based on the DC Comics character, will debut in the fall. The series will also cross over into the worlds of Arrow and The Flash, both on the CW as well. A question people have is why is the series only animated and not live action? With the heavy use of animals and the special effects needed, many comic book critics think that’s the reason the series is animated for now. Although it is only a Web series, fans are hopeful that eventually it will get its shine on network television. But in order for this to happen, viewers have to tune in online, just as with TV shows, to prove that the show is popular.